Trying to figure out where you are is probably one of humankind's oldest problems. Navigation and positioning are crucial to so many activities and yet the process has always been quite cumbersome and inexact. In the earliest days mankind used the stars to navigate. Early instruments also sited the stars to determine position. The science of horology began in part because navigation depended on precise timing the movement of the stars. Over the years all kinds of technologies have tried to simplify the task but every one has had some disadvantage. Finally, the U.S. Department of Defense decided that the military had to have a precise form of worldwide positioning. Fortunately they had the deep pockets it took to build something really good. The result is the Global Positioning System, a system that's changed navigation forever. Soon GPS will become almost as basic as the cell telephone. In fact, GPS technology is being used now in cell phones to implement the emergency ('911') location system. The basis of GPS is "triangulation" from satellites. To "triangulate," a GPS receiver measures distance using the travel time of radio signals. 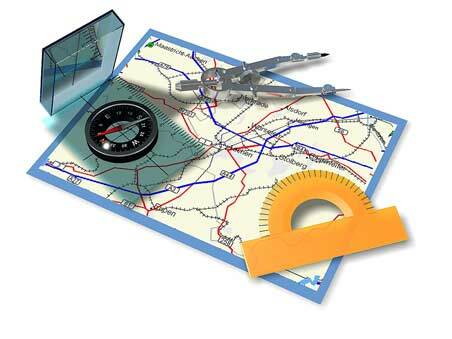 To measure travel time, GPS needs very accurate timing which it achieves with some tricks. Along with distance, you need to know exactly where the satellites are in space. High orbits and careful monitoring are the secret. You must correct for any delays the signal experiences as it travels through the atmosphere. Finally (for us), you can now obtain the precise time from the GPS satellites. We'll explain each of these points in subsequent sections. Improbable as it may seem, the whole idea behind GPS is to use satellites in space as reference points for locations here on earth. That's right, by very, very accurately measuring our distance from three satellites we can "triangulate" our position anywhere on earth. Forget for a moment how our receiver measures this distance. We'll get to that later. First consider how distance measurements from three satellites can pinpoint you in space. Position is calculated from distance measurements (ranges) to satellites. Mathematically we need four satellite ranges to determine exact position. Three ranges are enough if we reject ridiculous answers or use other tricks. Another range is required for technical reasons to be discussed later. Suppose we measure our distance from a satellite and find it to be 10,000 miles. Next, say we measure our distance to a second satellite and find out that it's 11,000 miles away. That tells us that we're not only on the first sphere but we're also on a sphere that's 11,000 miles from the second satellite. Or in other words, we're somewhere on the circle where these two spheres intersect. If we then make a measurement from a third satellite and find that we're 12,000 miles from that one, that narrows our position down even further, to the two points where the 12,000 mile sphere cuts through the circle that's the intersection of the first two spheres. So by ranging from three satellites we can narrow our position to just two points in space. This arrangement of satellites is also called a "constellation". To decide which one is our true location we could make a fourth measurement. But usually one of the two points is a ridiculous answer (either too far from Earth or moving at an impossible velocity) and can be rejected without a measurement. A fourth measurement does come in very handy for another reason however, but we'll tell you about that later. Next we'll see how the system measures distances to satellites. Distance to a satellite is determined by measuring how long a radio signal takes to reach us from that satellite. To make the measurement we assume that both the satellite and our receiver are generating the same pseudo-random codes at exactly the same time. By comparing how late the satellite's pseudo-random code appears compared to our receiver's code, we determine how long it took to reach us. Multiply that travel time by the speed of light and you've got distance. We saw in the last section that a position is calculated from distance measurements to at least three satellites. But how can you measure the distance to something that's floating around in space? We do it by timing how long it takes for a signal sent from the satellite to arrive at our receiver. In a sense, the whole thing boils down to those "velocity times travel time" math problems we did in high school. Remember the old: "If a car goes 60 miles per hour for two hours, how far does it travel?" In the case of GPS we're measuring a radio signal so the velocity is going to be the speed of light or roughly 186,000 miles per second. The timing problem is tricky. First, the times are going to be awfully short. If a satellite were right overhead the travel time would be something like 0.06 seconds. So we're going to need some really precise clocks. We'll talk about those soon. Suppose there was a way to get both the satellite and the receiver to start playing "Stairway to Heaven" at precisely 12 noon. If sound could reach us from space then standing at the receiver we'd hear two versions of the 'Stairway to Heaven', one from our receiver and one from the satellite. These two versions would be out of sync. The version coming from the satellite would be a little delayed because it had to travel more than 11,000 miles. If we wanted to see just how delayed the satellite's version was, we could start delaying the receiver's version until they fell into perfect sync. The amount we have to shift back the receiver's version is equal to the travel time of the satellite's version. So we just multiply that time times the speed of light and voila! we've got our distance to the satellite. That's basically how GPS works. Only instead of 'Stairway to Heaven' the satellites and receivers use something called a "Pseudo Random Code" - which is probably quicker to sing than 'Stairway to Heaven'. The Pseudo Random Code (PRC) is a fundamental part of GPS. Physically it's just a very complicated digital code, or in other words, a complicated sequence of "on" and "off" pulses. The signal is so complicated that it almost looks like random electrical noise. Hence the name "Pseudo-Random." There are several good reasons for that complexity: First, the complex pattern helps make sure that the receiver doesn't accidentally sync up to some other signal. The patterns are so complex that it's highly unlikely that a stray signal will have exactly the same shape. Since each satellite has its own unique Pseudo-Random Code this complexity also guarantees that the receiver won't accidentally pick up another satellite's signal. So all the satellites can use the same frequency without jamming each other. And it makes it more difficult for a hostile force to jam the system. In fact the Pseudo Random Code gives the Department of Defense a way to control access to the system. But there's another reason for the complexity of the Pseudo Random Code, a reason that's crucial to making GPS economical. The codes make it possible to use "information theory" to "amplify" the GPS signal. And that's why GPS receivers don't need big satellite dishes to receive the GPS signals. We glossed over one point in our silly 'Stairway to Heaven' analogy. It assumes that we can guarantee that both the satellite and the receiver start generating their codes at exactly the same time. But how do we make sure everybody is perfectly synced? Stay tuned and see. Accurate timing is the key to measuring distance to satellites. Satellites are accurate because they have atomic clocks on board. If our receiver's clocks were perfect, then all our satellite ranges would intersect at a single point (which is our position). But with imperfect clocks, a fourth measurement, done as a cross-check, will NOT intersect with the first three. So the receiver's computer says "Uh-oh! there is a discrepancy in my measurements. I must not be perfectly synced with universal time." Since any offset from universal time will affect all of our measurements, the receiver looks for a single correction factor that it can subtract from all its timing measurements that would cause them all to intersect at a single point. That correction brings the receiver's clock back into sync with universal time, and bingo! - you've got atomic accuracy time right in the palm of your hand. Once it has that correction it applies to all the rest of its measurements and now we've got precise positioning. One consequence of this principle is that any decent GPS receiver will need to have at least four channels so that it can make the four measurements simultaneously. With the pseudo-random code as a rock solid timing sync pulse, and this extra measurement trick to get us perfectly synced to universal time, we have got everything we need to measure our distance to a satellite in space. But for the triangulation to work we not only need to know distance, we also need to know exactly where the satellites are. In the next section we'll see how we accomplish that. To use the satellites as references for range measurements we need to know exactly where they are. GPS satellites are so high up their orbits are very predictable. Minor variations in their orbits are measured by the Department of Defense. The error information is sent to the satellites, to be transmitted along with the timing signals. Thus far we've been assuming that we know where the GPS satellites are so we can use them as reference points. But how do we know exactly where they are? After all they're floating around 11,000 miles up in space. That 11,000 mile altitude is actually a benefit in this case, because something that high is well clear of the atmosphere. And that means it will orbit according to very simple mathematics. The Air Force has injected each GPS satellite into a very precise orbit, according to the GPS master plan. On the ground all GPS receivers have an almanac programmed into their computers that tells them where in the sky each satellite is, moment by moment. The basic orbits are quite exact but just to make things perfect the GPS satellites are constantly monitored by the Department of Defense. They use very precise radar to check each satellite's exact altitude, position and speed. The errors they're checking for are called "ephemeris errors" because they affect the satellite's orbit or "ephemeris." These errors are caused by gravitational pulls from the moon and sun and by the pressure of solar radiation on the satellites. The errors are usually very slight but if you want great accuracy they must be taken into account. 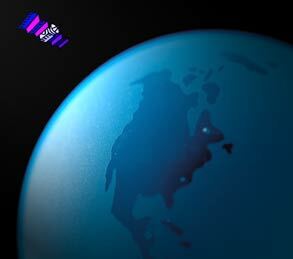 Once the Department of Defense has measured a satellite's exact position, they relay that information back up to the satellite itself. The satellite then includes this new corrected position information in the timing signals it's broadcasting. So a GPS signal is more than just pseudo-random code for timing purposes. It also contains a navigation message with ephemeris information as well. With perfect timing and the satellite's exact position you'd think we'd be ready to make perfect position calculations. But there's trouble afoot. The earth's ionosphere and atmosphere cause delays in the GPS signal that translate into position errors. See a summary of error sources. Some errors can be factored out using mathematics and modeling. The configuration of the satellites in the sky can magnify other errors. Differential GPS can eliminate almost all error. Up to now we've been treating the calculations that go into GPS very abstractly, as if the whole thing were happening in a vacuum. But in the real world there are lots of things that can happen to a GPS signal that will make its life less than mathematically perfect. To get the most out of the system, a good GPS receiver needs to take a wide variety of possible errors into account. Here's what they've got to deal with. First, one of the basic assumptions we've been using is not exactly true. We've been saying that you calculate distance to a satellite by multiplying a signal's travel time by the speed of light. But the speed of light is only constant in a vacuum. As a GPS signal passes through the charged particles of the ionosphere and then through the water vapor in the troposphere it gets slowed down a bit, and this creates the same kind of error as bad clocks. There are a couple of ways to minimize this kind of error. For one thing we can predict what a typical delay might be on a typical day. This is called modeling and it helps but, of course, atmospheric conditions are rarely exactly typical. Another way to get a handle on these atmosphere-induced errors is to compare the relative speeds of two different signals. This "dual frequency" measurement is very sophisticated and is only possible with advanced receivers. Trouble for the GPS signal doesn't end when it gets down to the ground. The signal may bounce off various local obstructions before it gets to our receiver. This is called multi-path error and is similar to the ghosting you might see on a TV. Good receivers use sophisticated signal rejection techniques to minimize this problem. Even though the satellites are very sophisticated they do account for some tiny errors in the system. The atomic clocks they use are very, very precise but they're not perfect. Minute discrepancies can occur, and these translate into travel time measurement errors. And even though the satellites positions are constantly monitored, they can't be watched every second. So slight position or "ephemeris" errors can sneak in between monitoring times. Basic geometry itself can magnify these other errors with a principle called "Geometric Dilution of Precision" or GDOP. It sounds complicated but the principle is quite simple. There are usually more satellites available than a receiver needs to fix a position, so the receiver picks a few and ignores the rest. If it picks satellites that are close together in the sky the intersecting circles that define a position will cross at very shallow angles. That increases the gray area or error margin around a position. If it picks satellites that are widely separated the circles intersect at almost right angles and that minimizes the error region. Good receivers determine which satellites will give the lowest GDOP. Although GPS is well-known for navigation, tracking, and mapping, it's also used to disseminate precise time, time intervals, and frequency. Time is a powerful commodity, and exact time is more powerful still. Knowing that a group of timed events is perfectly synchronized is often very important. GPS makes the job of synchronizing our clocks easy and reliable. There are three fundamental ways we use time. As a universal marker, time tells us when things happened or when they will. As a way to synchronize people, events, even other types of signals, time helps keep the world on schedule. And as a way to tell how long things last, time provides and accurate, unambiguous sense of duration. GPS satellites carry highly accurate atomic clocks. And in order for the system to work, our GPS receivers here on the ground synchronize themselves to these clocks. That means that every GPS receiver is, in essence, an atomic accuracy clock. Astronomers, power companies, computer networks, communications systems, banks, and radio and television stations can benefit from this precise timing. One investment banking firm uses GPS to guarantee their transactions are recorded simultaneously at all offices around the world. And a major Pacific Northwest utility company makes sure their power is distributed at just the right time along their thousands of miles of transmission lines. Beagle Software offers the Star Sync product which sets any Windows computer to the GPS clock and can serve as a time source for computers on a network. We hope you've enjoyed our brief discussion about the technology behind GPS. Additional Sources: NIST, NOAA, US Department of Defense, Garmin, Inc., Trimble Navigation Ltd.